Hello there, today I have a card to share that I made for my Dad for his birthday. Since my Dad is a drummer, I thought the drummer image from the Avery Elle Stoked set would be perfect for him! I started off with a panel of white cardstock, cut using a SSS Stitched Square die. I then blended TH Distress Inks in Blueprint Sketch and Tumbled Glass in to the centre. I then used the TH Distress Spritzer with a Tumbled Glass Distress Marker and spritzed some of this on to the panel too. The image was stamped on to white cardstock, cut out using the matching die and coloured using Copic Markers. The sentiment was stamped in the middle drum. The background panel was adhered to a white 4.75"x4.75" card base with foam sheet. I then added the drummer on top with foam tape. To finish off, I applied a generous coat of Glossy Accents over the centre drum. COPIC MARKERS: Boy - Skin: E13, E11, E00, E50. Hair: E49, E47, E44. Shirt: R89, R59, R39, R29, R27. Drumsticks - E44, E43, E42. Drums: C5, C3, C00, W3, W1, W00, B18, B26, B24. Cymbals - Y28, Y26. I stamped a happy birthday sentiment on the inside of the card. I hope my Dad likes it! Thanks so much for visiting me today. I hope you have a great day! This is so cool, Michelle! I bet your dad is going to love it!!!! 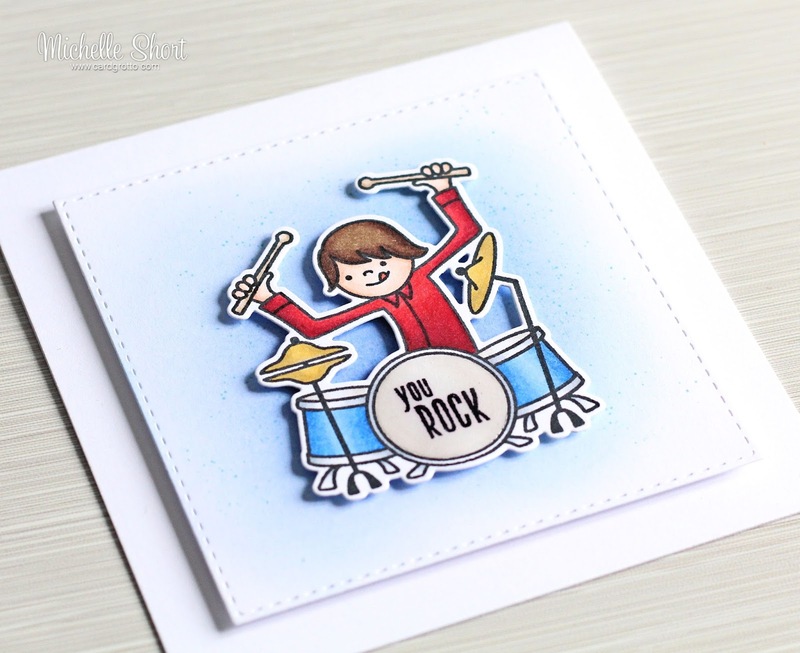 Perfect card for a drummer, and I love the look of the inking and spritzing behind the image and how you stamped the sentiment onto the center drum!!! 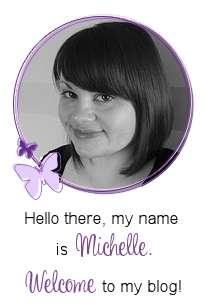 This is fab Michelle! 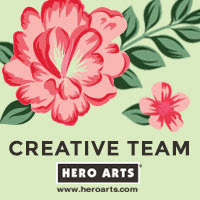 What a great image and I love the soft blue background you have created for it. Your Dad will love it! Amazing. Love he masculine card. Great for all ages. My teenage son would love this, and his birthday is next month. I hope your dad has a great birthday. 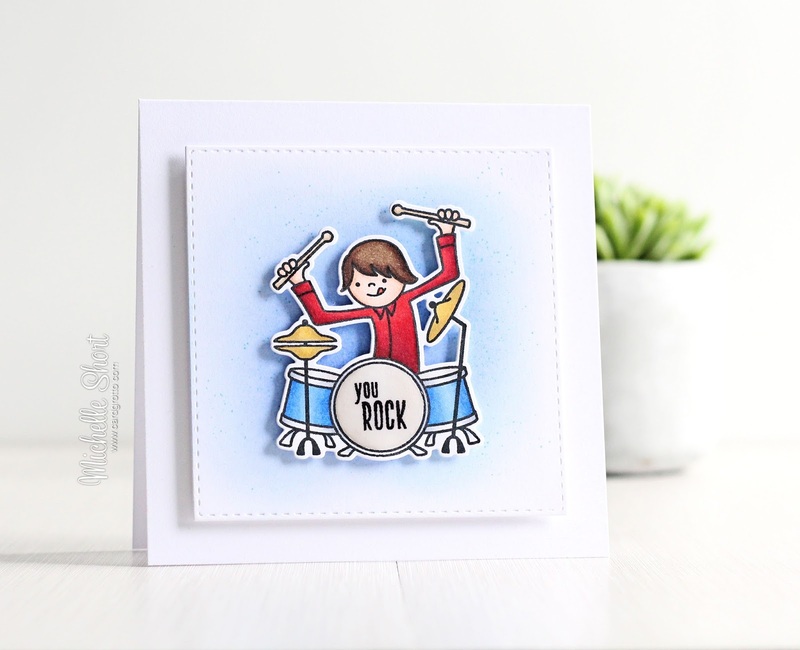 Brilliant card for any drummer, love it.